From the earliest collaborations with our clients we understood the value in offering expertise and flexibility in our approach to the range of materials, processes and finishes that we provided. Today, Amuneal’s skilled and ever-curious craftsmen continue to work in hundreds of material types across our state-of-the-art wood and metal fabrication facilities. 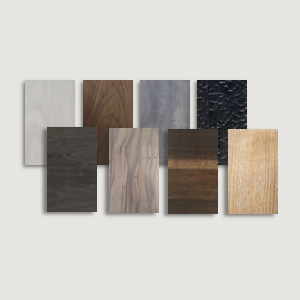 Our confidence working across multiple materials is complimented by an incredible array of custom metal and wood finishes that blend a highly technical approach to manufacturing with a handcrafted sensibility. Amuneal’s reputation has been built on the ability to fearlessly combine artisan finish techniques with state-of-the-art engineering and fabrication processes to create over 1000 custom metal finishes. Our in-house wood studio combines cutting-edge technology, an exquisite level of craftsmanship and the same approach to finishing techniques that have long distinguished Amuneal’s nuanced metal finishes. 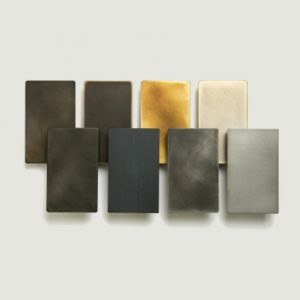 We stock most of the finishes on our site and can ship them to you within 2-3 business days. 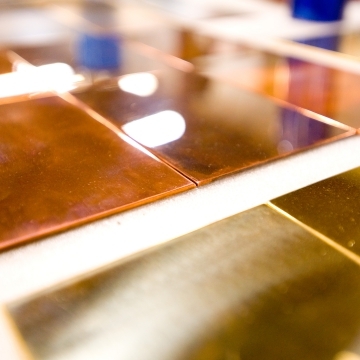 Custom finishes can take a bit longer depending on complexity.